Ergonomic design racing chair--more efficiently and comfortably, multi-function meet all kinds of body shape. 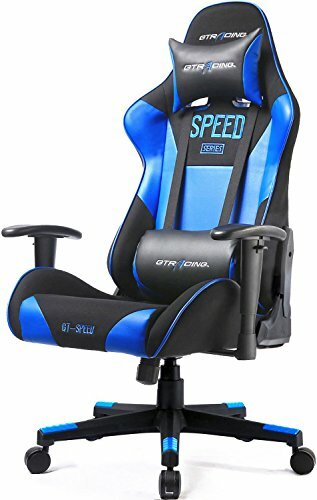 Material: Metal frame, easy to clean PVC, removable headrest pillow and lumbar cushion make it an ideal seat of choice for working, studying and gaming Function: The chair has rocked back and forth. Adjustable backrest with a 90°-170° safety angle. Armrest and seat-height adjustment; 360-degree swivel; 5-point base is built with heavy duty and smooth-rolling casters; Dimensions: 27.56"(L) x 20.08"(W) x 50"-53.54"(H); Maximum weight capacity - 330 pounds. 1-year limited warranty. Assembly instructions included. Ergonomic design racing chair--more efficiently and comfortably, multi-function meet all kinds of body shape. Dimensions: 27.56"(L) x 20.08"(W) x 50"-53.54"(H); Maximum weight capacity - 330 pounds. View More In Video Game Chairs. If you have any questions about this product by GTRACING, contact us by completing and submitting the form below. If you are looking for a specif part number, please include it with your message.